The art of reckoning. This must have been familiar to the ancient Hebrews. The sacred books mention large amounts, showing that the people were acquainted with the art of computation. Expressions are found even for fractions (see Gesenius, "Lehrgebäude," 704). 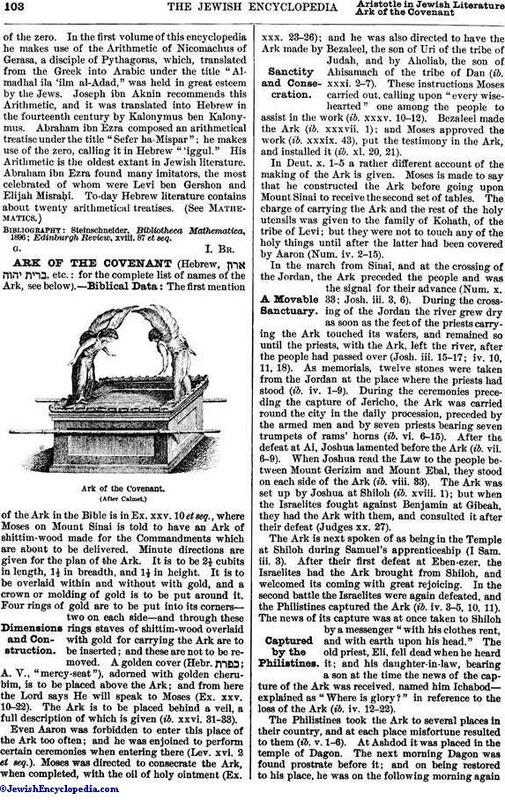 The Hebrews, like the Greeks and other people of antiquity, made use of the letters of the alphabet for figures. According to their alphabetical order, the letters were made to express the units, tens, and hundreds, as high as 400. In a later period, probably after contact with the Arabs, the final letters ך ץ ף ן ם were added, so as to furnish numerals up to 900; mention of this fact is made in many cabalistic writings, but seemingly they were not generally used. The question arises whether, in computations with these letters, the ancient Hebrews had any fixed system taught in the schools, or whether each calculator was left to his own manipulation of them. The probabilities are in favor of the former hypothesis, in view of the high degree of mathematical knowledge found here and there in the Mishnah and Gemara. Nothing of such a system has, however, come down to us from the Talmudic times. Skilful Jewish arithmeticians are first mentioned in the eighth century. Sahl Rabban al-Tabari, the teacher of the physician Razi's father, was known as an excellent arithmetician (Wüstenfeld, "Aerzte," p. 20). About 997 the Jewish mathematician Bisher ben PinḦas ben Shubeib wrote an arithmetical treatise. At the same epoch lived Josephus Hispanus, or Sapiens, from whom Gerbert (Pope Sylvester II.) borrowed his system of multiplication and division (see Cajori, "History of Elementary Mathematics," p. 179), and who is believed to have been the introducer of the so-called Arabic numerals into Europe (see Weissenborn, "Einführung der Jetzigen Ziffern in Europa," pp. 74 et seq.). In the beginning of the eleventh century there flourished Abraham ben Ḥiyya, who wrote an encyclopedia of mathematical sciences; he used Arabic numerals, but knew nothingof the zero. 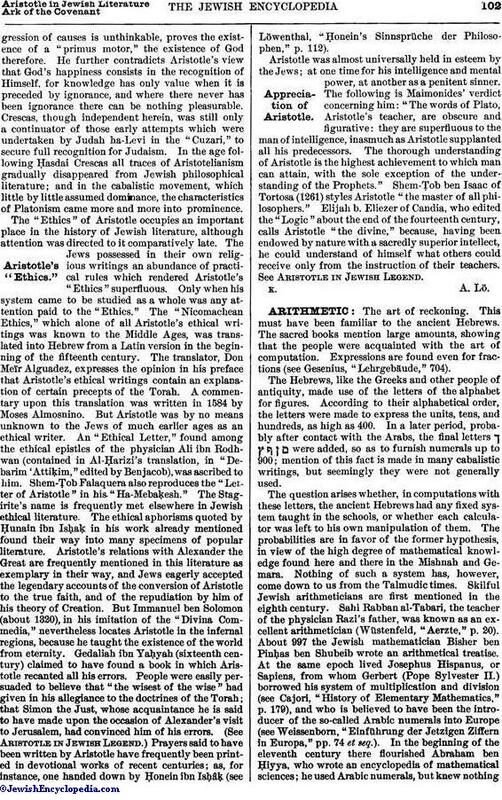 In the first volume of this encyclopedia he makes use of the Arithmetic of Nicomachus of Gerasa, a disciple of Pythagoras, which, translated from the Greek into Arabic under the title "Almadhal ila 'ilm al-Adad," was held in great esteem by the Jews. Joseph ibn Aknin recommends this Arithmetic, and it was translated into Hebrew in the fourteenth century by Kalonymus ben Kalonymus. Abraham ibn Ezra composed an arithmetical treatise under the title "Sefer ha-Mispar"; he makes use of the zero, calling it in Hebrew "'iggul." His Arithmetic is the oldest extant in Jewish literature. Abraham ibn Ezra found many imitators, the most celebrated of whom were Levi ben Gershon and Elijah MisraḦi. To-day Hebrew literature contains about twenty arithmetical treatises. Edinburgh Review, xviii. 87 et seq.